If you are trying to fix a TP-Link TD-8616 modem, chances are good that this is your problem. On May 21, 2012, I purchased from Newegg a new TP-Link ADSL TD-8616 DSL modem to replace a very old Westell modem that was supplied by Verizon. At that time, the reviews for this product were overwhelming positive. Less than two years later, this TP-Link modem is already broken, and I see that recent reviews are more up and down. Simply put, this modem had garbage capacitors, which is a common quality-control manufacturing problem with modern electronics. Symptoms: for the past several months, connection was erratic, sync erratic, speeds fluctuating. Unable to connect to modem admin via TCP-IP. a 470uf “GJT” capacitor with bulging vent, high-esr and low capacitance. The other caps that I removed from the modem are piled on the face of the meter. All the other caps, except for one, tested similarly bad ESR — extremely bad. These were easy to troubleshoot in-circuit with my ESR meter, so repair was easy to diagnose and fast to perform. The values of these caps (two of 470uf and 5 of 100uf) are all values that I keep on hand, so the modem was repaired in less than a half hour. Since all seven caps were from same manufacturing lot, and therefore junk, I replaced all of them even though one was still good. 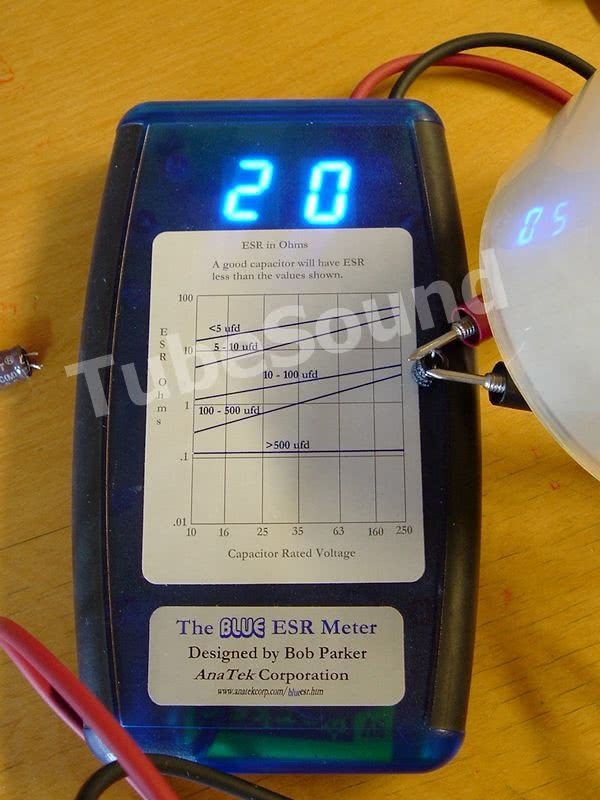 ESR is “Equivalent series resistance” and is measured in ohms. 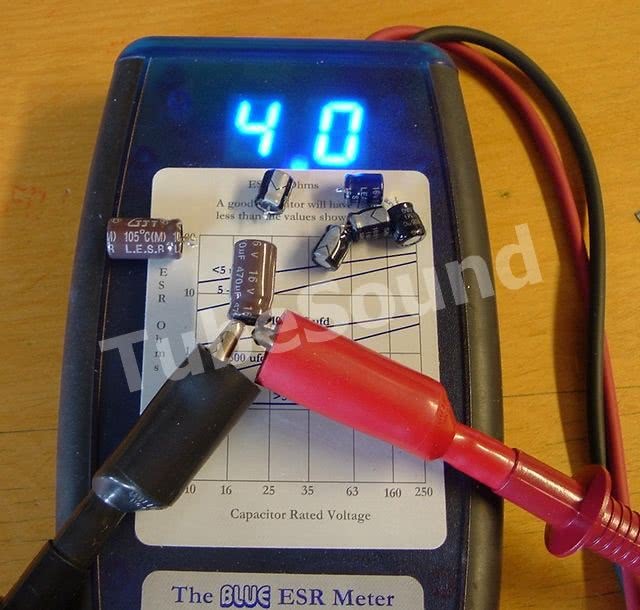 As a comparison, I will show you how a “good” and “better” capacitor will test for ESR. First of all, you should understand that ESR must be compared ( vs. ) a new cap of SAME CAPACITANCE value. In other words, you cannot compare the ESR of a 100uf to that of a 470uf. Second, if you are using an ESR meter, do not rely on the “ESR charts” they give you. They are very loose guidelines and not necessarily accurate. Your best comparison will always be to compare the old cap vs a new cap of same capacitance. This photo shows testing a typical new “general purpose” 100uf capacitor. 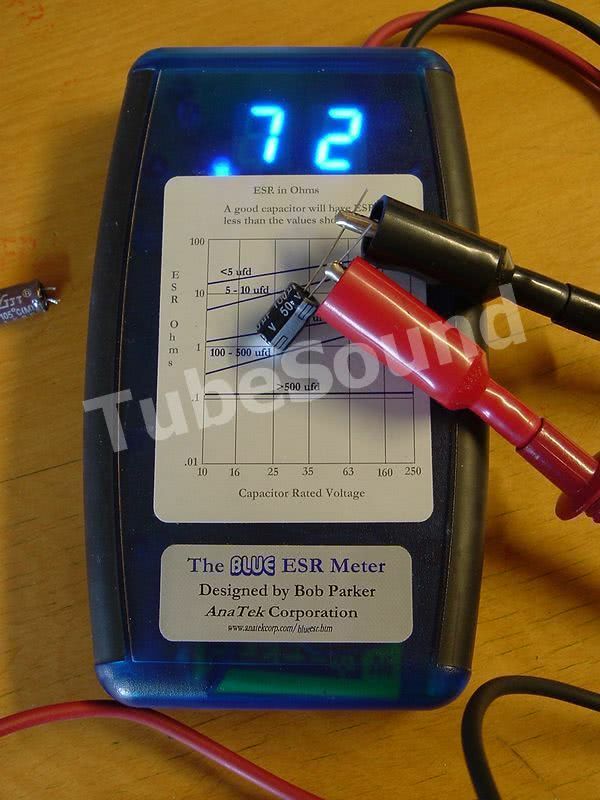 ESR is 0.72 ohms, and in my experience should be less than 1.0 to be of reasonable quality. This cap is perfectly fine for most uses, but will not work well in a circuit that requires a low ESR capacitor. This photo shows testing of a Rubycon ZL-series 100uf low ESR capacitor. 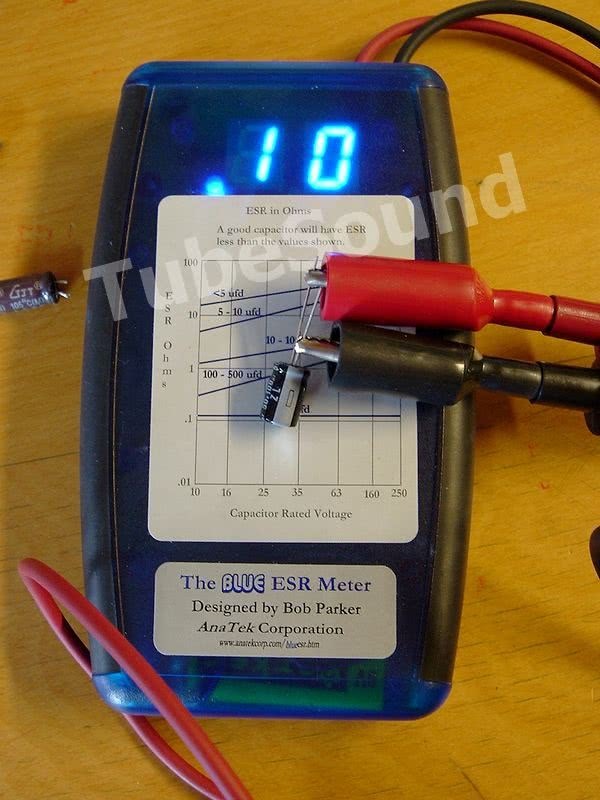 As you see, it tests much lower ESR than a “general purpose” capacitor, testing at 0.10 ohms. This cap would be a good choice for low ESR circuits. One final note: don’t get caught up in thinking that you should always buy low ESR caps for all of your projects. Some regulators (low dropout regulators) require a certain amount of ESR in order to work properly. (Often, if you examine the datasheet of the regulator, it will specify a minimum and maximum ESR for the capacitor.) Thus, installing a low ESR cap will actually cause that kind of circuit to not work at all, or be unstable. In most cases, I only use low ESR caps when they are required, such as in switch mode power supplies.